CHILD ABUSE IS NEVER OK. 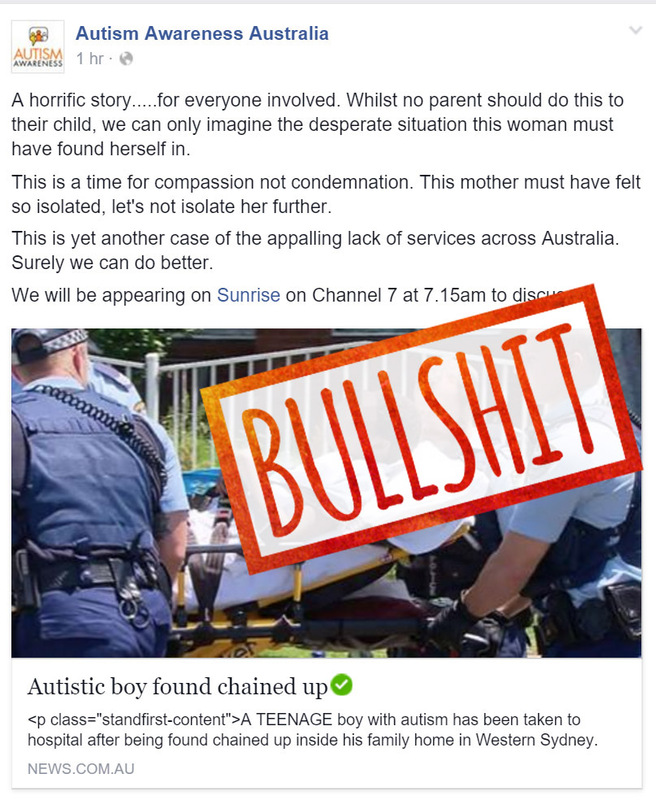 In response to Autism Awareness Australia’s post about a mother chaining her child to a bed and leaving them at home alone while she went out grocery shopping – which they justified because the child is Autistic. “A horrific story…..for everyone involved. Whilst no parent should do this to their child, we can only imagine the desperate situation this woman must have found herself in. This is a time for compassion not condemnation. This mother must have felt so isolated, let’s not isolate her further. This is yet another case of the appalling lack of services across Australia. Surely we can do better. Please write on the Sunrise Facebook wall or Tweet to Sunrise and ask them to reconsider interviewing Nicole Rogerson from Autism Awareness Australia tomorrow (11th November 2015) at 7.15am in the morning.